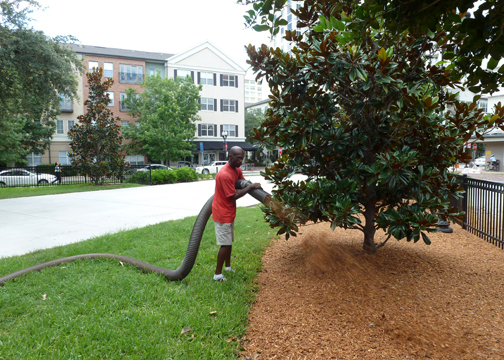 Major Mulch Installations is "Florida's Premier Mulch Blowing and Mulch Installation Company." We service a wide variety of commercial projects including: Business Centers, Apartments, Condominiums, Hotels, Shopping Centers, Churches, and Special Events to name a few. At Major Mulch Installations we are very passionate about providing the very best customer service and value for your money. Technology plays a key role. We use state-of-the-art mulch blowing trucks that maximize efficiency and effectiveness. In addition, we have an expert team of installers on staff that provide fast, friendly, and professional service for your property. 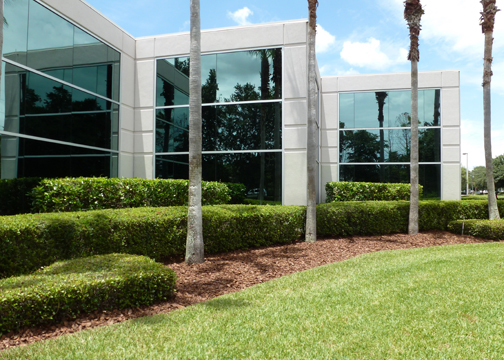 We want to continue to partner with you to help keep your commercial property's curb appeal looking crisp with regular applications of new mulch. As you know, fresh mulch makes your entire property look well maintained and gives a great first impression to your potential customers. Our customers return to us year after year because of our commitment to excellence and our superb mulch products. We have over 14 years of experience and we are dedicated to providing the best mulch installation service possible. Please check out our Mulch Types Section where you can choose the type of mulch that is the perfect match and look for your landscape. Our job is to make your job easier and more economical, so give us a call today to schedule your next mulch installation project at (407) 291-9895. Major Mulch Installations is ready to handle all of your residential mulching needs. Our job is to make your job easier. Mulch installation is one of the simplest and most beneficial landscaping practices you can perform when caring for your property. Installing mulch is also a great way to beautify and define your landscape beds while at the same time getting the most value for your dollar. Major Mulch Installations is widely regarded in the landscape and mulch industry as the most professional and reliable blow-on mulch installation company in Florida. Furthermore, Major Mulch Installations is the industry's technological leader in mulch installation; therefore, your home's landscape is mulched quickly and efficiently with state-of-the-art mulch blowing trucks. As a result, your landscape is given a very elegant, finished look – something that is extremely difficult to obtain by hand spreading the material. Nothing compares to the beautiful look and results of a home mulched by Major Mulch Installations. Please check out our Mulch Types Section where you can choose the type of mulch that is the perfect match and look for your landscape. Our job is to make your job easier and more economical, so give us a call today to schedule your next mulch installation project at (407) 291-9895. Major Mulch Installations is recognized as the leader in playground mulch installation. We service playgrounds for Child Care Centers, Cities, Schools, Counties, Churches, Parks and Community Centers to name a few. Using our state-of-the-art mulch blowing trucks, we can quickly and efficiently install certified playground mulch into your playground. A special added advantage our blow-on trucks provide you with is we can install the exact amount of mulch in the areas you need it most. For example, sometimes you may need to build up the fall zone areas with extra mulch and then blend in the remaining areas. According to the Consumer Product Safety Commission, each year, more than 200,000 children go to U.S. hospital rooms with injuries associated with playground equipment. Most injuries occur when a child falls from the equipment onto the ground. Playground injuries can be minimized or sometimes even prevented by proper installation of certified playground mulch. Our Premium Plus Certified Playground Mulch is exclusively designed for playgrounds. It has a uniformed look that is approximately ¾" rectangular shaped chips which is golden in color and provides an outstanding cushioned surface that stays in place. 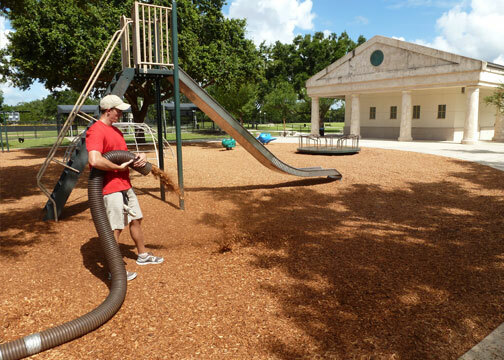 Our job is to make your job easier and more economical, so give us a call today to schedule your next playground mulch installation project at (407) 291-9895. 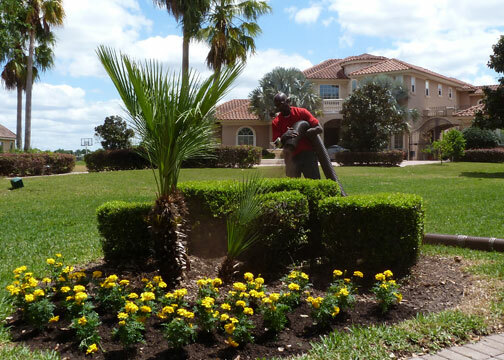 Major Mulch Installations is widely regarded in the landscape and mulch industry as the most professional and reliable blow-on mulch installation company in Florida. We have been servicing the mulching needs of Local Governments, Counties, Cities, Utilities, Water Treatment Plants, Schools, Parks, Playgrounds, Administrative Offices, and Roadways in Florida for over 14 years. Our customers return to us year after year because of our commitment to excellence. We have the experience and are dedicated to providing the best mulch installation service possible. Major Mulch Installations blow-on mulch service is a very fast, economical, and efficient way to complete your next municipal mulch project. It also gives your landscape an elegant finished look – something that is extremely difficult to obtain by hand spreading the material. We provide a wide variety of mulch choices listed under our Mulch Types Section for your review. Our job is to make your job easier and more economical, so give us a call today to schedule your next mulch installation project at (407) 291-9895. Major Mulch Installations, an Orlando mulch supplier, is Central Florida's premier mulch blowing and mulch installation company. We provide mulch installation services using mulch blowing trucks for quick and easy installation. We serve the greater Central Florida area including Orlando, Tampa, Melbourne, Jacksonville, and more! © 2019 Major Mulch Installations. All Rights Reserved.